The Orang Rimba ("Forest People"), or Suku Anak Dalam, are an indigenous Indonesian ethnic group that lives in Jambi. They live in the forest – in places such as Bukit Tiga Puluh National Park (TNBTP) and Bukit Duabelas National Park (TNBD) – but now, Orang Rimba who maintain their traditional lifestyle are found only in TNBD. Very few of them are left. According to a survey conducted by KKI Warsi – a non-profit organization that has been assisting the Orang Rimba since 1997 – their population within TNBD is down to around 1500 persons, with no significant increase since then. The main reason for their gradual disappearance is the conversion of their forests into production areas. This began in 1978, with the first massive wave of transmigrants into Jambi, and in 1991 a vast swathe of forest was converted into an industrial acacia plantation. Gradually, the Orang Rimba began moving into the transmigration areas, there to eke out a marginal existence; most of them now live in oil palm plantation areas rather than in natural forests. In fact, the forest products that constitute their traditional livelihood are valuable assets. One forest product with strong export value, called jernang (Daemonorops sp. ), or dragon blood, is useful for its resin. Jernang resin, a natural coloring material, is used in the marble, ceramic, woodworking, and porcelain industries, and is also a potent herbal medicine used to treat internal and external injuries. The Orang Rimba also grow jelutung trees, which provide raw material for chewing gum. Yet most of the Orang Rimba have abandoned their traditional livelihoods, and those few who maintain it are engaged in a constant struggle to uphold their identity. Indonesia now has a perfect opportunity to catch up with those countries: Golden wild silk, the like of which is found nowhere else, is being seriously cultivated, and Indonesia may well take over from these more established silk producers. 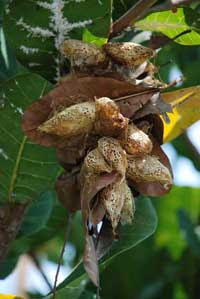 Indonesia's seriousness about cultivating wild silk is evident from the increasing utilization of previously empty land. This can be seen, for example, in Karangtenga h village, Yogyakarta. Once dry and barren, the area is now lush and green. Row after row of trees and seedlings have been planted to produce raw silk – cashew, soursop, avocado, mahogany, and other species. Raw silk cultivation in Karangtengah is being developed by the Yayasan Royal Silk foundation (Yarsilk) to produce gold thread and various handicrafts. In the area, covering dozens of hectares, they are concentrating on breeding two varieties of wild silk moth: Attacks Atlas (brown wild silk moth) and Circular (golden wild silk moth). In fact, Indonesia has over 25 species of wild silk moth, but the primadonna is the golden wild silk moth. Since it was learned that there are so many varieties of wild silkworms, especially in Yogyakarta–through research and discovery assisted by Professor Hiromu Akai, who has served for 20 years as President of the International Wild Silk Moth Society, in cooperation with Gadjah Mada University, which led him to declare that this type of golden wild silk moth has not been found in any other countries. Enthusiasm for silk moth cultivation has been tremendous. Indonesia was granted the opportunity to attend the Second World Silk Moth Conference in Hotaka, Japan (the first was in China and the third in India), to observe how the world's major silk players such as China, India, Thailand and Japan produce such good silk. After gaining confidence, Indonesia was then honored to serve as host for the fourth world conference, in Yogyakarta in 2002. At this event, golden wild silk was promoted and attracted enormous attention, particularly from the senior players in the silk industry. Most of us have never invested, I know there are many people out there who want to learn how to invest, but are apprehensive because they just don't have the education or the background to make informed choices. Lot of investment choices offered today, ranging from lands estate, house, stocks, mutual funds, index funds, bonds, real estate. we must be careful in choosing what investment we will take. if you are interested in learning the fundamentals of investing. try the gold. There are several ways to buy gold: You can buy and store actual gold in the form of coins or bullion bars from dealers or the U.S. Mint. You can buy shares in mining stocks. You can invest in a mutual fund that has assets in gold. various type of gold available, starting coins, jewelry, bullion. 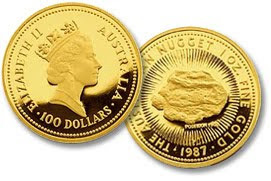 but its a great choice if you choose gold coins or gold bullion as your investment. because Gold has historically kept its value in times when the dollar has been weak or declining. For this reason, it could be a way to buffer your savings against the hazards of inflation. Goldcoinsgain.com offered gold coins around the world. choose one or several of them as your types of investment. how to get my own gold in my IRA? goldcoinsgain.com offers gold IRA transfer. create your own account, it easy!. please visit goldcoinsgain.com for more information they will show you the things you need to know as you start on this journey and they will be there to help you every step of the way. and then, start your gain profit investment there.